This is a diagram of 1 move tsume problem #4 with extra pieces in hand. In shogi, you must often choose a right piece to drop(or move) to secure victory. At the diagram, you have a Bishop, Silver, kNight in hand. Please consider what next move will checkmate the Gote's King on 2b. Don't let Gote's King go away to his upper space. You will find the answer clicking 'comment' in this entry. The right answer is B*3a which does not allow Gote's King to escape to 1c. In other check moves such as N*1d or R-3a+, it can escape to 1c. Can we have more Tsume questions? I would appreciate if I have more Tsume questions to practise on. Thanks! It has been very useful to help me improve my tsume shogi. 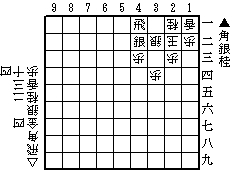 I would like to ask is there any way to contact you if I have any questions related to Shogi? I hope you don't mind since I couldn't find any English-speaking professional Shogi players to consult my problems with. Thank you for this site ,games and problems!!! !